Hands-down the winner, considering all the double-dipping that went on. This sauce lacked a spicy kick, but it’s still the favourite because it’s reminiscent of Thai sweet chilli. 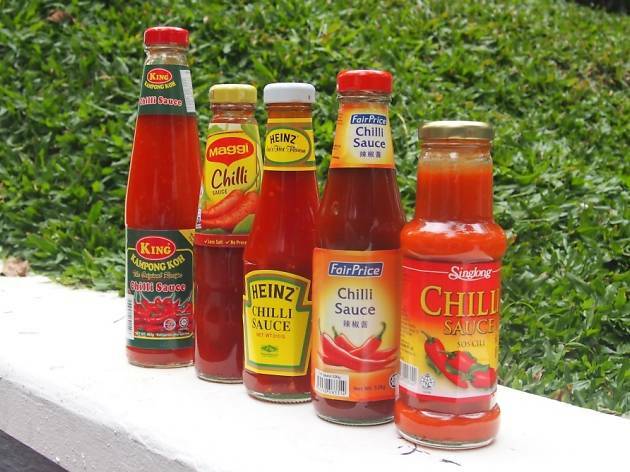 The brand only imports one flavour of chilli sauce locally, so even if it’s not your typical kind, it’s still one for keeps in the pantry. Just by opening the bottle, we could smell the garlic notes. 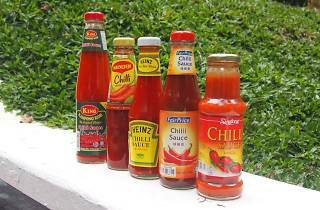 The sauce reminded us of the kind you’d pour over chicken rice – a bit like what they serve you at McDonald’s. We didn’t expect much from this house brand, but at slightly more than a dollar a bottle, it’ll do in a pinch. The chilli sauce looked and tasted like tomato paste, and was viscous as well. Recommended if you need copious amounts of fake blood. Surprisingly, the brand most are familiar with didn’t fare as well in the taste-test. We voted it as ‘forgettable’. This watery sauce didn’t leave much of an impression, but was consistently mistaken for Maggi chilli sauce. It tasted more of vinegar than spice and lacked a strong chilli fragrance.